As a kid in Mexico City, Maxine Proskurowsky went to a bilingual immersion school and got an international baccalaureate degree. She studied international relations at Mt Holyoke College and at the U of Stockholm, where she met her husband Andrzej, a Polish refugee. 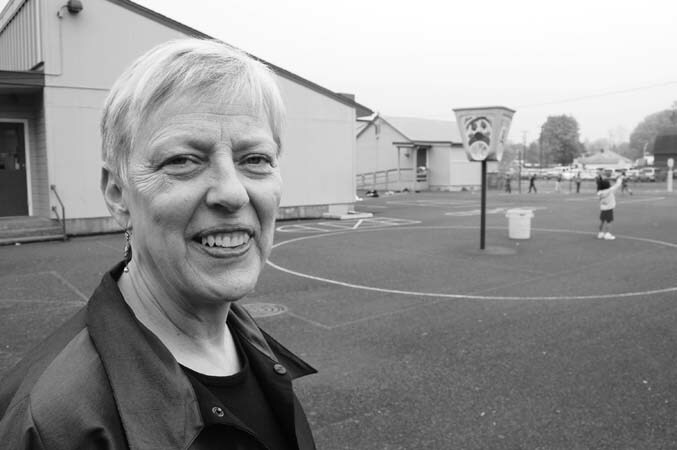 After he took a UO faculty position in 1975, she went for a nursing degree at Creighton, then returned and eventually spent 11 years as a school nurse at Whiteaker Elementary, the lowest-income school in the state. "Most of my career, I've been involved in politics, advocating for children's health," says Proskurowsky, a longtime proponent of school-based health centers, who was awarded a Robert Wood Johnson Executive Nurse Fellowship in 2003. "It was an opportunity to work with nurses from all around the country." For the past four years, she has served as Program Manager for Health Services at Eugene District 4J, whose four school-based centers provide care on a sliding scale to all students. Her office is located at River Road/El Camino del Rio Elementary, now in its second year as a bilingual immersion school. "I remember 1990," she notes, "when the first Latino family showed up at Whiteaker. It took 20 years to get to this point."